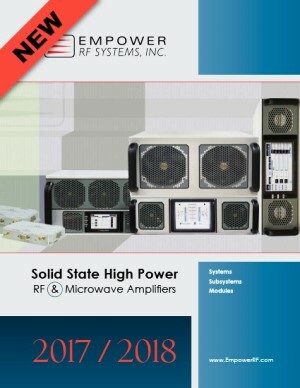 Empower RF Systems IMS 2017 Technical Presentation "Multi-Use Interoperable RF Amplifier"
Newly available is Empower RF Systems latest brochure describing the capabilities and features of the most advanced RF amplifier systems available in the world. Founded in 1999, Empower RF Systems is a global leader in power amplifier solutions that are critical to defense, commercial, and industrial market applications. With our origins in the design of broadband and band-specific solid state power amplifiers, Empower continues to advance the science of RF power amplification to produce rugged, power efficient, and cost-effective solutions. It is our priority to design and deliver high quality, innovative products which address customer systems and business requirements.